Femoral neck fractures are serious injuries associated with a high mortality and significant morbidity in the geriatric population. The incidence has increased since the 1960s and is expected to continue to increase as life expectancies increase. [1, 2, 3] Despite advances in surgical hardware and techniques, these injuries still pose a significant clinical challenge. The primary complications arising from femoral neck fractures are nonunion and avascular necrosis (AVN). Ultrasonography does not play a significant role in the routine evaluation of hip fractures. 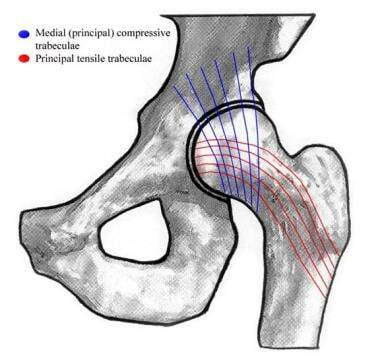 However, this modality has been used in research to evaluate the degree of distention of the hip joint capsule after fractures and in the study of elevated intracapsular pressures. Sonograms can also depict the presence of an intracapsular hematoma, which is mildly echogenic, as distinguished from synovial fluid, which is anechoic. 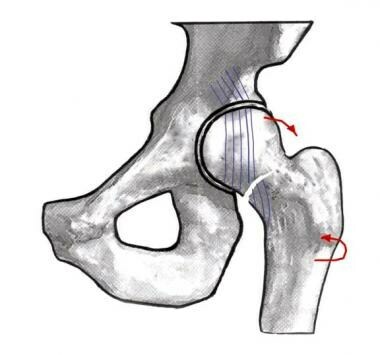 Image depicting the trabecular system of the hip that is used in Garden staging. A stage I Garden fracture (seen in the images below) is an incomplete subcapital fracture. The femoral shaft is twisted externally. 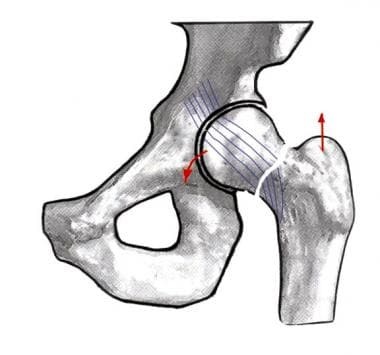 The alignment of the trabeculations of the distal femoral neck relative to the femoral head (which itself is adducted) causes the fracture to be in a valgus configuration. In other words, the trabecular markings in the femoral neck are displaced away from the midline relative to those in the femoral head. The altered angle of the trabeculations is greater than 180º when viewed on the AP projection (normally 160º). Such fractures are inherently stable. Image depicting a Garden I hip fracture. Radiograph demonstrating a Garden I hip fracture. Magnetic resonance image of a Garden I hip fracture. Bone marrow edema is now present in the femoral neck on this short-tau inversion recovery (STIR) image. A stage II Garden fracture (seen in the images below) is a complete, but nondisplaced, fracture. The femoral head is abducted, but the femoral neck has moved in such a way as to maintain normal alignment with the femoral head. These fractures are considered stable and have a favorable prognosis. 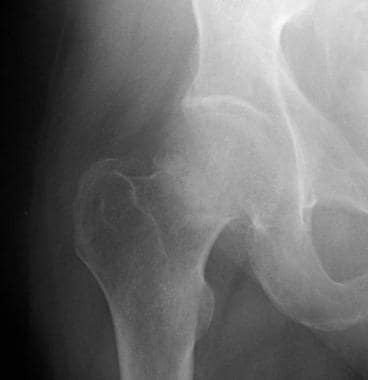 Image depicting a Garden II hip fracture. Radiograph depicting a Garden II hip fracture. 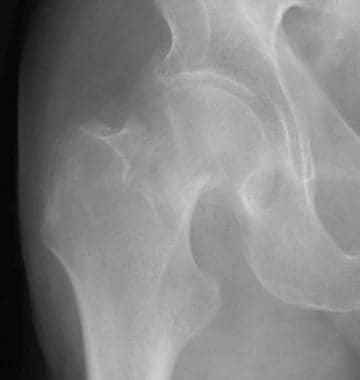 Sagittal T1-weighted magnetic resonance image of a Garden II hip fracture. This image demonstrates a low-signal-intensity line that passes through the femoral neck. Coronal short-tau inversion recovery (STIR) magnetic resonance image of a Garden II hip fracture. This image demonstrates bone marrow edema in the femoral neck, as well as edema in the adjacent muscles. A stage III Garden fracture (seen in the images below) is a complete, partially displaced subcapital fracture. The femoral shaft is externally rotated. 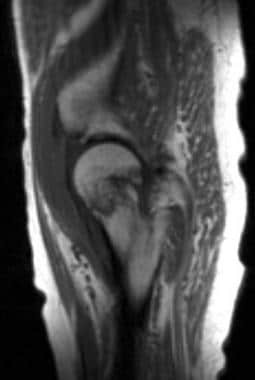 The femoral head is abducted and axially rotated such that its superior surface resides more anteriorly. The alignment of the femoral neck relative to the head is in varus deformity. 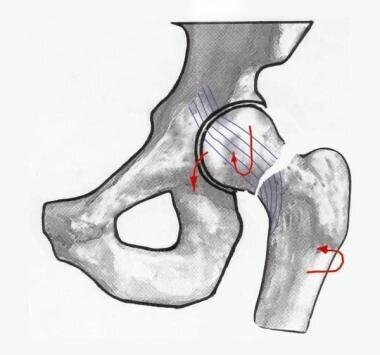 Image depicting a Garden III hip fracture. Radiograph depicting a Garden III hip fracture. A stage IV Garden fracture (seen in the images below) is a complete and fully displaced fracture. The femur is externally rotated and superiorly displaced relative to the femoral head. The head, now completely detached from the neck, remains in anatomic position relative to the acetabulum. This fracture is considered unstable with a poor prognosis. 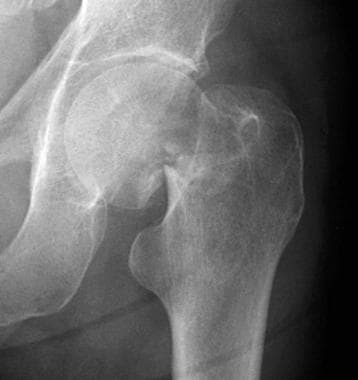 Image depicting a Garden IV hip fracture. Radiograph depicting a Garden IV hip fracture. Stage 0 has no radiographic findings. This preclinical stage is diagnosed by MRI or bone scanning. Stage 1 manifests as slight osteoporosis on plain images. Clinical symptoms may be present, but sclerosis is not. Stage 2 involves diffuse osteoporosis and sclerosis at the region of the infarction. The infarcted area is well delineated due to a reactive shell of bone. The spherical shape of the femoral head is maintained. Stage 3 results in the crescent sign, or a radiolucency under the subchondral bone, which represents a fracture. The contour of the femoral head is abnormal. The joint space is preserved. Stage 4 is characterized by femoral head collapse, joint-space narrowing, and subchondral sclerosis. The Ficat-Arlet classification is especially pertinent in Garden III and IV fractures, in which there is a significant incidence of AVN. Radiography is the preferred initial imaging modality for evaluating femoral neck fractures because of its near universal availability, its ease of acquisition, and its documented correlation with surgical results over many years of use. However, radiography has some limitations (as demonstrated in the image below). Spiral fractures are difficult to assess on a single view. Comminution is also not as easily demonstrated as it is with CT scanning. Some stress fractures are simply not visible on plain images. Radiograph with a poor depiction of an incomplete fracture of the left femoral neck. If the clinical suspicion for a femoral neck fracture is strong, even if it is not visible on radiographs obtained during the initial evaluation, the patient can be further evaluated with MRI, which shows bone marrow edema, or nuclear medicine bone scanning, which shows increased tracer uptake. Although CT scanning is the most useful test for evaluating bony injury, axial fractures in the plane of the images can occasionally be missed. This potential risk is decreased with the use of images that are reconstructed in the orthogonal planes and with newer multidetector CT (MDCT) scanners. MRI is the premiere imaging modality, especially in the setting of stress fractures, which can appear normal on initial plain images, because of the superior contrast of MRI when appropriate pulse sequences are used, the modality's intrinsic spatial resolution, and MRI's ability to image in multiple planes (coronal, axial, and, less commonly, sagittal). Popular pulse sequences include coronal and axial T1-weighted and T2-weighted fat-suppressed sequences, although several other bone marrow sequences can also be used. In practice, a large field of view is generally used so that both hips and the bony pelvis can be imaged simultaneously. Intravenous contrast enhancement is not routinely used in the assessment of fractures. The fracture line can be visualized as linear low-signal-intensity areas surrounded by bone marrow edema, which is hypointense relative to normal marrow on T1-weighted images or hyperintense on T2-weighted images. The drawbacks of MRI include its longer imaging time, its relative lack of widespread availability, its higher costs, and the exclusion of patients with cardiac pacemakers and certain metal hardware in their body. With continued technological advances, however, the imaging time of MRI has decreased, as have the costs. MRI is the most sensitive modality for detecting bone marrow changes that are related to AVN, even when radiographic findings are normal; therefore, MRI is the imaging modality of choice in this regard. When AVN is detected after surgical fixation for a femoral fracture, the patient can become a candidate for placement of a prosthesis. 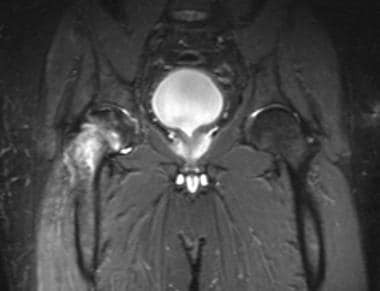 More importantly, MRI can be used to detect the early stages of ischemic necrosis in the femoral head, so that interventions can be initiated before further damage occurs, such as femoral head collapse, secondary osteoarthritis, and fragmentation. MRI is currently the best imaging modality for detecting femoral neck fractures. Several facts must be kept in mind, however. 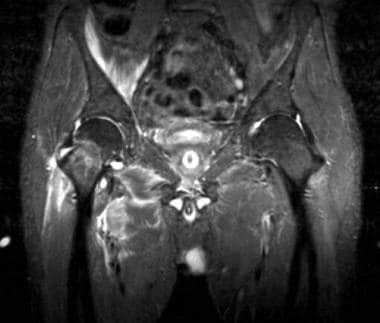 The normal bone marrow of the pelvis and hips can have an appearance that is patchy and of intermediate signal intensity, corresponding to the persistence of red marrow. Also, the subchondral area of the femoral head can sometimes have a thin rim of red marrow. These normal variants should not be confused with fractures. Fractures and contusions should not be confused with idiopathic transient osteoporosis of the hip. Transient osteoporosis is an uncommon, self-limited disease that affects middle-aged men and pregnant women. This condition appears as osteopenia on plain radiographs and as areas of decreased T1 signal intensity and increased T2 signal intensity that generally extend from the femoral head to the intertrochanteric line on MRI. Usually, only one hip is affected at a given time. To complicate matters, transient osteoporosis can predispose patients to a fracture if proper care (eg, protected weight bearing) is not implemented. Approximately 80% of fractures can be visualized 24 hours after trauma, via diffusely increased tracer uptake. By 3 days after trauma, 95% of fractures are visualized, and maximal fracture sensitivity is found at 7 days; this knowledge may be helpful in equivocal cases. Given the high sensitivity of nuclear medicine studies, they can be used to diagnose suspected femoral neck fractures that have not been confirmed by means of plain radiography. Bone scan of the left hip. This image shows increased uptake in the left femoral neck. 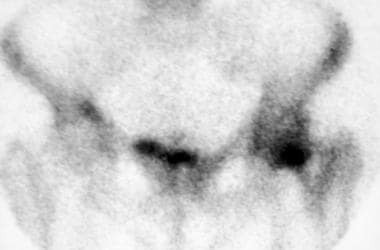 Although sensitive, bone scintigraphy is not specific for fractures. Other processes, such as infection, inflammation, and tumor formation, can also demonstrate increased radionuclide uptake. However, in the right clinical setting (eg, known trauma), bone scintigraphy is highly sensitive for the detection of fractures. Raaymakers EL. Fractures of the femoral neck: a review and personal statement. Acta Chir Orthop Traumatol Cech. 2006. 73(1):45-59. [Medline]. Schmidt AH, Swiontkowski MF. Femoral neck fractures. Orthop Clin North Am. 2002 Jan. 33(1):97-111, viii. [Medline]. Macaulay W, Yoon RS, Parsley B, Nellans KW, Teeny SM,. Displaced femoral neck fractures: is there a standard of care?. Orthopedics. 2007 Sep. 30(9):748-9. [Medline]. O'toole RV, Dancy L, Dietz AR, Pollak AN, Johnson AJ, Osgood G, et al. Diagnosis of femoral neck fracture associated with femoral shaft fracture: blinded comparison of computed tomography and plain radiography. J Orthop Trauma. 2013 Jun. 27(6):325-30. [Medline]. Ward RJ, Weissman BN, Kransdorf MJ, Adler R, Appel M, Bancroft LW, et al. 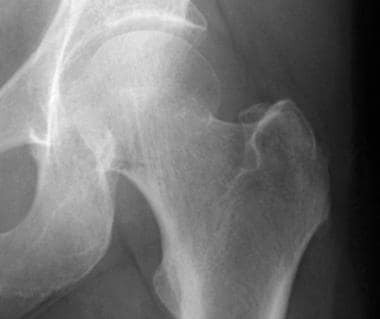 ACR appropriateness criteria acute hip pain-suspected fracture. J Am Coll Radiol. 2014 Feb. 11 (2):114-20. [Medline]. [Full Text]. Ullmark G, Sundgren K, Milbrink J, Nilsson O, Sörensen J. Metabolic development of necrotic bone in the femoral head following resurfacing arthroplasty. 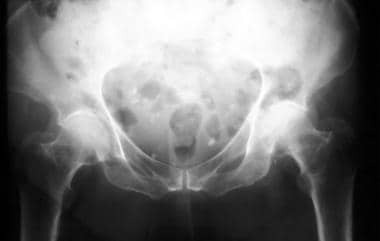 A clinical [18F]fluoride-PET study in 11 asymptomatic hips. Acta Orthop. 2012 Feb. 83(1):22-5. [Medline]. [Full Text]. Gómez-Hoyos J, Schröder R, Reddy M, Palmer IJ, Martin HD. Femoral Neck Anteversion and Lesser Trochanteric Retroversion in Patients With Ischiofemoral Impingement: A Case-Control Magnetic Resonance Imaging Study. Arthroscopy. 2015 Sep 7. [Medline]. Yuan HF, Shen F, Zhang J, Shi HC, Gu YS, Yan ZQ. Predictive value of single photon emission computerized tomography and computerized tomography in osteonecrosis after femoral neck fracture: a prospective study. Int Orthop. 2015 Jul. 39 (7):1417-22. [Medline]. Thevenot J, Hirvasniemi J, Pulkkinen P, Määttä M, Korpelainen R, Saarakkala S, et al. Assessment of risk of femoral neck fracture with radiographic texture parameters: a retrospective study. Radiology. 2014 Jul. 272 (1):184-91. [Medline]. Ollivier M, Le Corroller T, Blanc G, Parratte S, Champsaur P, Chabrand P, et al. 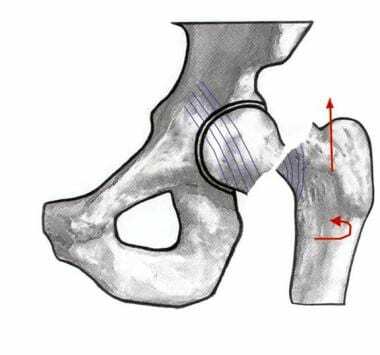 Radiographic bone texture analysis is correlated with 3D microarchitecture in the femoral head, and improves the estimation of the femoral neck fracture risk when combined with bone mineral density. Eur J Radiol. 2013 Sep. 82 (9):1494-8. [Medline]. Thomas RW, Williams HL, Carpenter EC, Lyons K. The validity of investigating occult hip fractures using multidetector CT. Br J Radiol. 2016. 89 (1060):20150250. [Medline]. [Full Text]. Greenspan A. Orthopedic Radiology: A Practical Approach. 3rd ed. Philadelphia, Pa: Lippincott Williams & Wilkins; 2000. Cody JP, Evans KN, Kluk MW, Andersen RC. Occult femoral neck fracture associated with vitamin D deficiency diagnosed by MRI: case report. Mil Med. 2012 May. 177(5):605-8. [Medline]. Thrall JH, Ziessman HA. Nuclear Medicine: The Requisites. 2nd ed. St Louis, Mo: Mosby-Year Book; 2001. Han S, Oh M, Yoon S, Kim J, Kim JW, Chang JS, et al. Risk Stratification for Avascular Necrosis of the Femoral Head After Internal Fixation of Femoral Neck Fractures by Post-Operative Bone SPECT/CT. Nucl Med Mol Imaging. 2017 Mar. 51 (1):49-57. [Medline]. [Full Text]. Fan W, Zhu L, Chen J, Guo C, Yan Z. Identifying Patients Who Will Most Benefit from Single Photon Emission Computerized Tomography and Computerized Tomography After Femoral Neck Fracture. Med Sci Monit. 2017 Nov 28. 23:5669-5674. [Medline]. [Full Text].